How to Draw SysML Requirement Diagram? A SysML requirement diagram enables you to visualize any kind of requirements of your system, both functinal and non-functional. You can also visualize the inter-relationships between requirements. By using SysML requirement diagram with UeXceler, you have a complete set of system requirements that involve the business goal, the user stories that describe user problems/concerns and the requirements to address the problems. In the New Diagram window, select Requirement Diagram. To create a Requirement in a SysML requirement diagram, click the Requirement button on the diagram toolbar and then click on the diagram. Release the mouse button at the place where you want the decomposed requirement to be created. Select Containment -> Requirement from Resource Catalog. A new requirement will be created and is connected to the source requirement with a containment connector. Enter its name and press Enter to confirm editing. To inline edit the property of a Requirement (e.g. ID), double-click on the property, enter new value and press Enter to confirm. 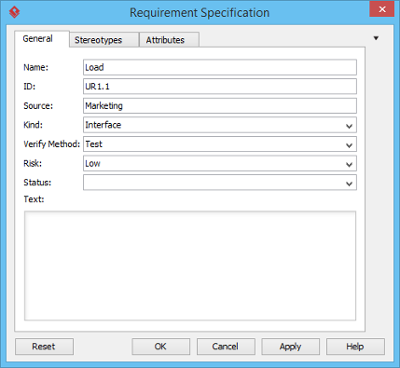 You can edit the properties of a requirement through the specification window. To open the window, click on the tiny magnifier icon at the top right of a Requirement shape. A test case describe the possible scenarios for testing a requirement. To create a Test Case, click the Test Case button on the diagram toolbar and then click on the diagram. Move your mouse pointer to the Test Case. Press on the Resource Catalog button at top right and drag it out. Move the mouse pointer over a Requirement and then release the mouse button, a Verify relationship will be created from the Test Case to the Requirement.